This Indian gem's covered patio brings cozy firelight in winter and the delights of a garden view in summer. : "Serene" is the word for this Indian gem, especially in summer, when doors on the covered patio are thrown open to bring in the evening air --- you can even dine amidst the flowers. 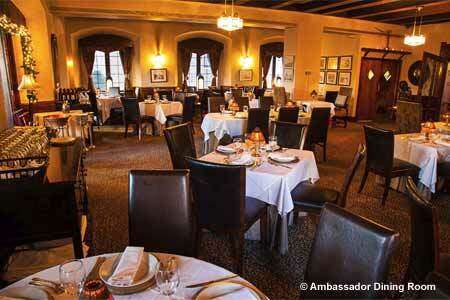 Although located in a Tudor-style apartment complex, and catering to many resident fans, the Ambassador attracts diners from far and wide, drawn by both atmosphere and cuisine. From the tandoori lamb filet and smooth lamb korma to the complex renderings of dishes like chana --- a chickpea curry perfumed with ground turmeric, cumin and coriander --- fresh, clear flavors pervade. Food is attractively plated: that chana comes topped with crisp-fried onions and sided with gently spiced potatoes and fragrant basmati rice. Add a bread, like the lamb naan with its smoky edge from the tandoor oven, and some cucumber raita and you'll have a memorable feast. Lunch is served buffet-style.